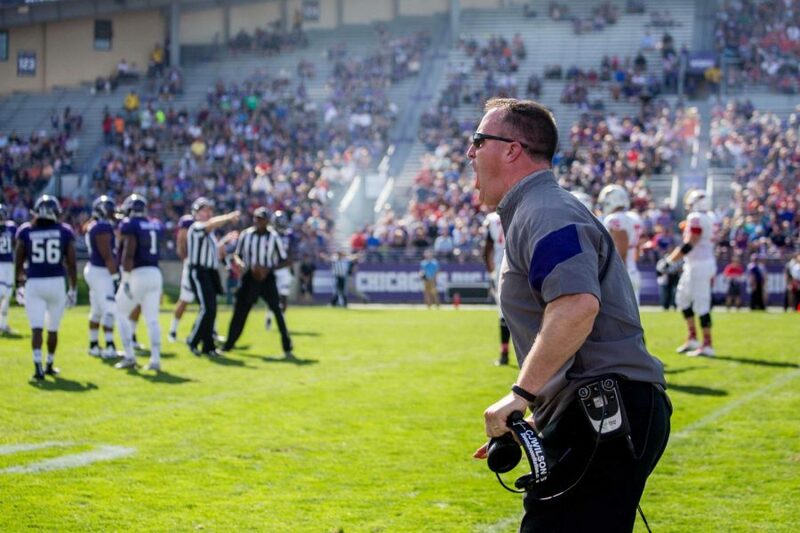 Coach Pat Fitzgerald yells at players during last season's game against Illinois State. Fitzgerald discussed a number of offseason topics during Tuesday's Big Ten Media Days. CHICAGO — Northwestern will be among the last schools in the country to open training camp when it begins Aug. 5, a move made in part because of the University’s academic calendar. Speaking Tuesday at Big Ten Media Days, coach Pat Fitzgerald said he made the decision after speaking to his leadership council, which prioritized time off between the end of summer classes and the beginning of camp. Fitzgerald expressed his frustration over new restrictions that prevent any form of two-a-day practices, a change made outside the standard legislative process and one that will force the Wildcats to eliminate days off during training camp. The traditional mid-August scrimmage in Kenosha, Wisconsin, will also be scrapped in favor of additional practice time, Fitzgerald said. Nonetheless, Fitzgerald and the leadership council, including senior safety Godwin Igwebuike, felt the later start made the most sense. Fitzgerald made the surprising announcement that NU has added several kickers, bringing the number of players competing for the open job to seven. As of Tuesday, just four players are listed at kicker on the roster — walk-ons Mason Weissenhofer and Drew Luckenbaugh, graduate transfer Luke Otto and freshman Charlie Kuhbander — none of who have ever appeared in a game for the Cats. Graduate transfer Makay Redd was listed only in the media guide, and freshman Cody Gronewold, who kicked in high school, is listed as a punter. Weissenhoffer, Luckenbaugh and Kuhbander were seen as the primary contenders for the kicking role vacated by Jack Mitchell. Fitzgerald, however, said of the open competition that “we’re going to see how that’s going to play out” and added that Weissenhoffer and Luckenbaugh both struggled with consistency in spring practice. Fitzgerald also expressed dismay over the play of his tackles, saying that “we need to play better at the tackle position” and indicating that junior Blake Hance has, at least temporarily, lost the starting role at left tackle. He added that seven players were competing for the starting and reserve roles at both left and right tackle. Though competition among a small handful of players was expected at the open spot at right tackle, Fitzgerald’s announcement that so many players were still in the mix was unexpected. Fitzgerald seemed particularly perturbed by the play of Hance, who started all 13 games at left tackle last year, but frequently displayed inconsistency. Graduate transfer Trey Klock, redshirt freshman Gunnar Vogel and sophomore Andrew Otterman appear to be candidates for increased playing time at each tackle spot.